We do what we do because we enjoy the work, but it feels pretty good when our customers let us know it makes them happy too! Here are some customer comments and photographs of completed work. "Received the gun yesterday. It's a thing of beauty. You guys did a fabulous job. I haven't had a chance to fire it yet, but cosmetically, it is awesome. I can't say enough about how good it looks. Tell everyone thank you very much." --Customer LM and his Chesapeake Bay Retriever Louie. Steel Guide Rod Kit and Replacement Rail Screws in his 9mm CX4 (with Sightmark optic), on a wild hog hunt in Texas. "I've received my rifle from USPS today. Upon first inspection, I must say that your level of quality is second to none. It looks like it was produced that way from the factory. Thank you again for transforming my boring, uncomfortable carbine into a real weapon. I will do my best to recommend your services to all that will listen." "Wonderful. Just finished putting the SierraPapa new and improved trigger assembly back in the Berreta cx-4. What an improvement. No slack, no inconsistencies with the pull, nice smooth pull and excellent, consistent break. Perfect. [...] You should be proud that you could fix it. Good work." "I had an opportunity to put my Storms together today and sight them in. The conversions exceeded my expectations. They now look the way they should’ve from the factory. Thanks." --Customer JWO in Indiana. Several Hammer/Trigger/Spring and Guide Rod Kits, and Extended Bolt Charging Handle. 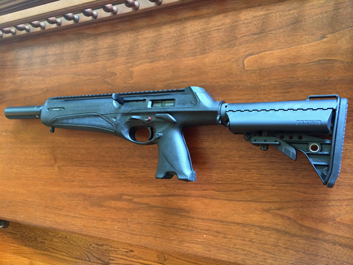 The CX4 above has the C-More sight, Go Gun thumb rest on left side rail, with the muzzle threaded and custom brake designed by ZR Tactical Solutions. "I am placing an order for one of your Extended Bolt Charging Handles. 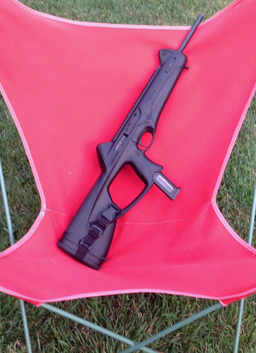 [...] My Beretta CX4 currently has every, with the exception of the AR-15 stock adapter and the top rail, upgrade you have put out. I find your products have greatly increased the utility and reliability of this weapon. Thank you." "Received in good condition, both mods totally transformed the storm into an awesome weapon. Thanks for your help and good service." "Part sent, worked on, returned, and re-installed within one week. You guys rock. And I love the crisp new trigger in my CX4! Now for a beer before installing my snazzy new guide rod kit. A big thanks to you and Paul"